Will Davis remained on a roll, while a rookie notched a win in his first attempt, in exciting JBT NM-TX Conference action at Holiday Bowl in Albuquerque. Bowlers competed in 'pick your poison' after qualifying, where higher seeds choose the bowler they want to play against. Down to four bowlers in the scratch division, Davis ousted Zach Harvey 240-169, and Nathan Nguyen escaped from Yarelis Alvarez 184-179 to set up the final. The title game came down to the wire, with Nguyen needing to double for the title. Nathan didn't get the strikes, and that gave Will the win, 5th career JBT title, and third consecutive on his current tear through the conference. In the handicap semifinals, Gabe Alvarado beat Antonio Ontiveros 239-209, and Jeremiah Martin stopped JD Messenger 209-179 to set up a rare all-rookie title game. Neither finalist performed like a rookie though, both coming up with big frames. In the end, Martinez' tenth frame spare locked up a 244-240 win and first JBT title for Jeremiah. 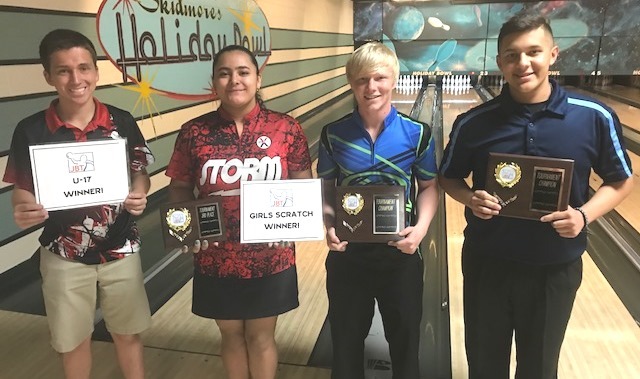 Josh Williams earned the U17 event with a win over Alvarez, but Yarelis was probably okay with that, as she not only beat Aillen Linares for the Priority Girls Scratch win, but also blasted a perfect 300 game in matchplay, the first of her career. Big thanks as always to the team at the beautifully remodeled Holiday for hosting our Tour. Want in on all the fun for all averages and ages? There's still time this season, come on down!